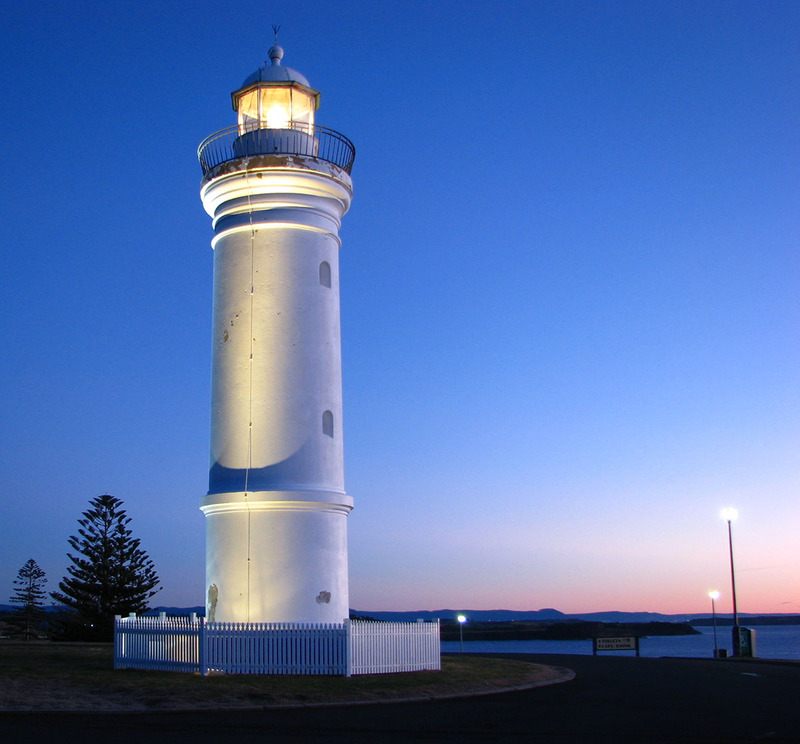 Kiama Lighthouse | Lighthouses of Australia Inc. 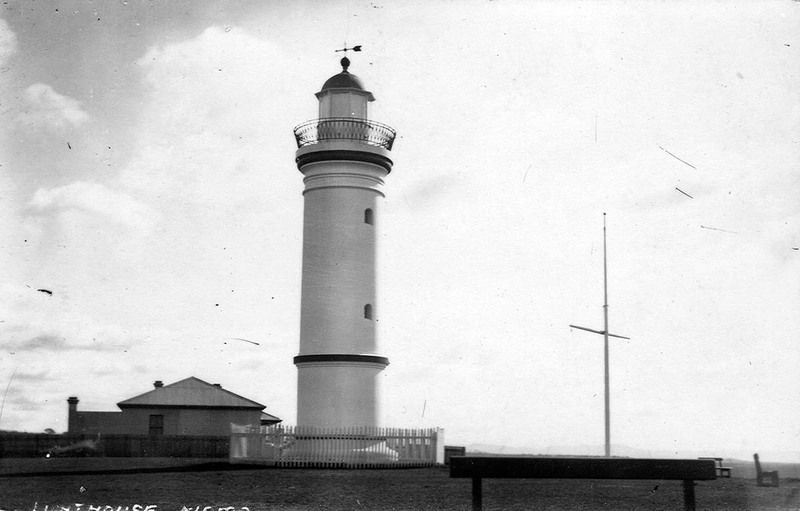 The light was established in 1887, 10 years after the creation of the Robertson Basin, a manmade harbour to service Kiama. 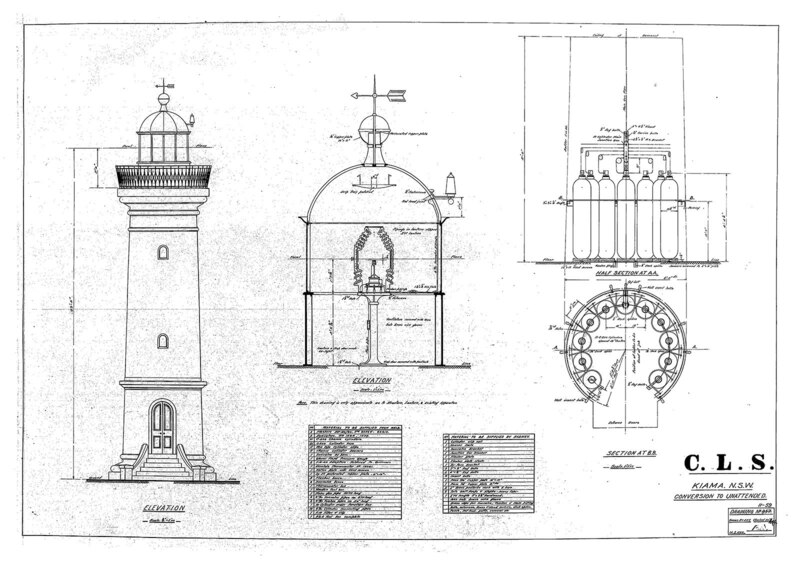 Continuous local commercial pressure especially after the construction of Robertson Basin led to tenders being called for the construction of the lighthouse in 1886. The manmade harbour serviced Kiama’s supply of crushed blue metal and paving blocks for the streets of Sydney. The tower, built on Blowhole Point, is constructed of brick and rendered outside with concrete. The total cost for the tower and apparatus was £1,350. 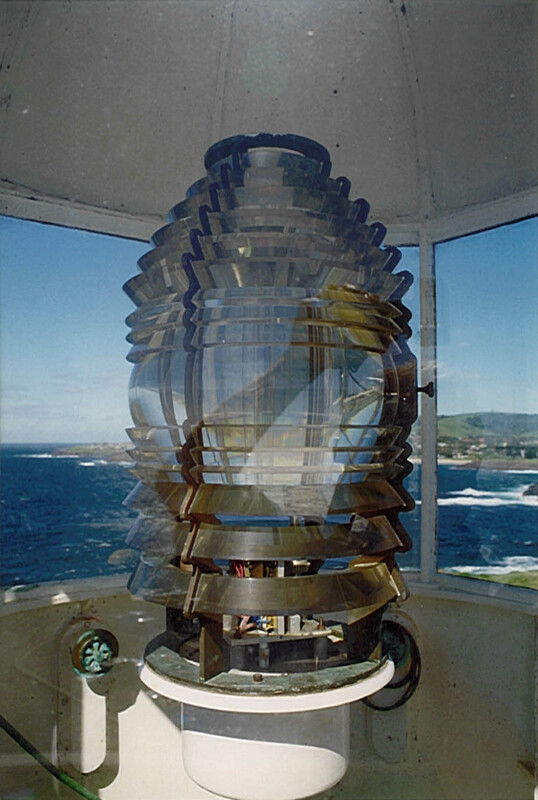 The original apparatus was an oil burner with a catadioptric fixed lens producing a 600 candela green light that was visible for nine miles. This was upgraded to the local town coal gas in 1908 with an intensity of 1,500 candelas and a range of fifteen miles. This was further upgraded to acetylene gas and group flashing in 1920. At this point the light was demanned, though Brewis stated in 1913 that the light was unwatched, the keeper’s cottage being vacant. 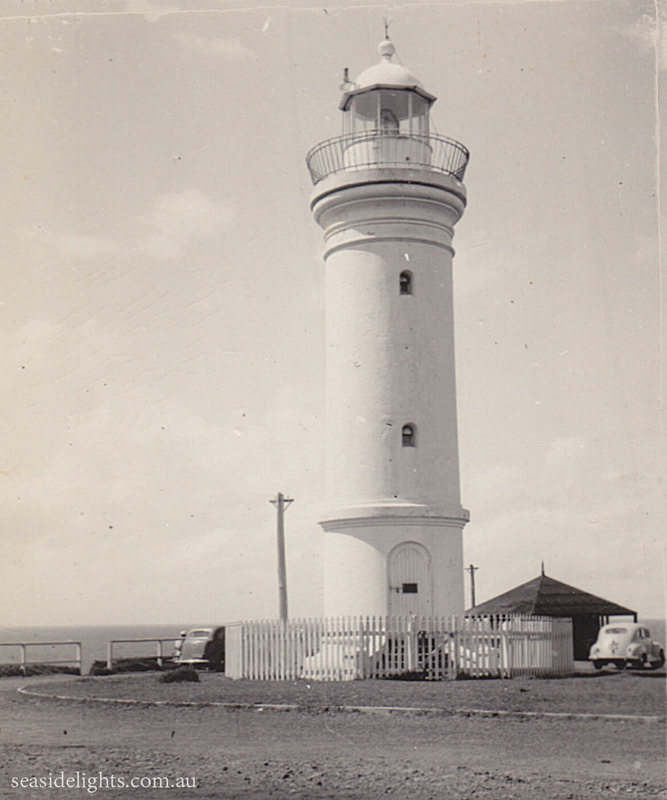 In 1969 the light was converted to 240v mains electricity with battery back up. The Pilot's cottage in the foreground. 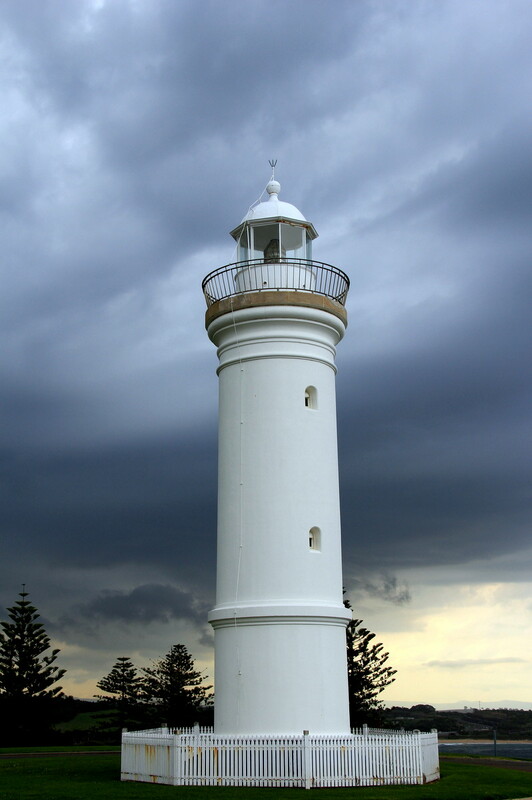 Situated on the round apex of Blowhole Point, the Kiama lighthouse stands from sea level to the light at a height of 224 feet. The foundation is concrete, 14 feet in depth and 12 feet in diameter; from the bottom of the foundation to the top of the entrance is 16 feet. The height of the building from the floor to the coping is 36 feet, to the light is 40 feet, and to the top of the weather vane is 50 feet. The building is of brick, cemented outside and plastered within. The ascent is accomplished by means of three iron ladders, leading from one storey to another, the staircase being lighted by side lights. 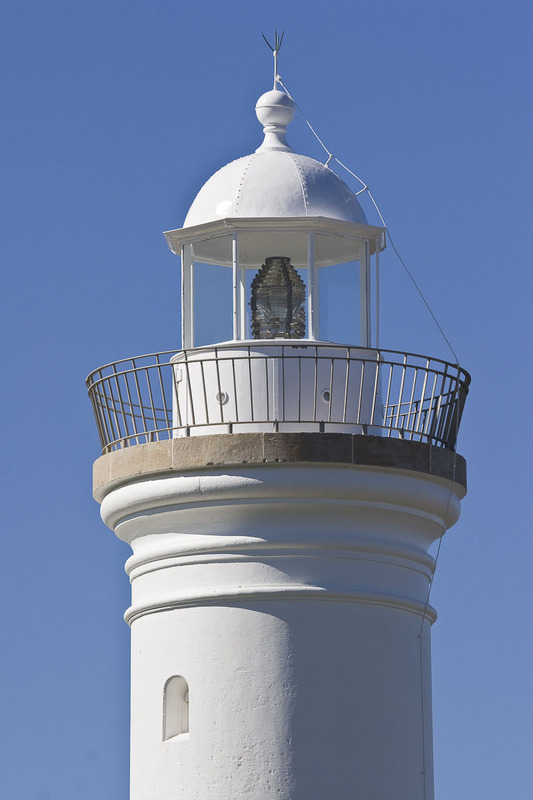 The top of the structure is surrounded by a very artistic railing; and the light, which will be of a similar magnifying power to the Hornby light, near Watson’s Bay, is very shortly expected to arrive from England. 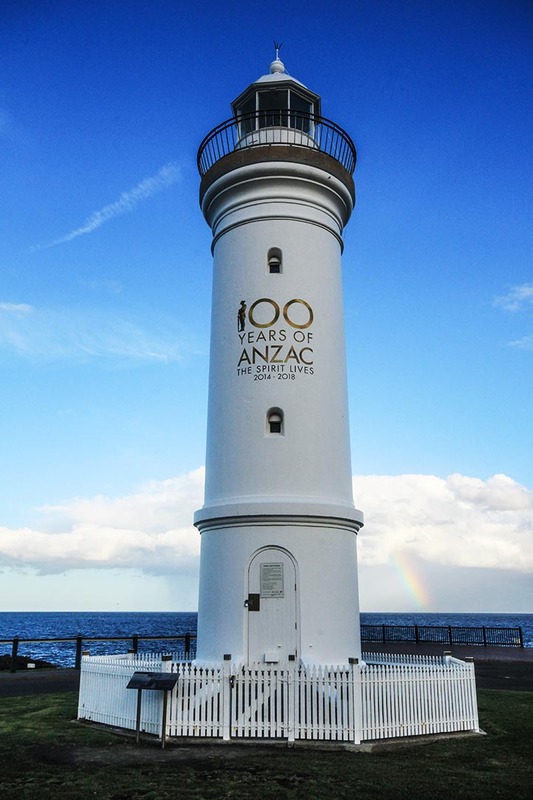 The lighthouse is now quite finished, so far as the contractors are concerned, with the exception of receiving two or three coats of paint, which is now being done. A neat hexagonal fence is being erected round the building which will give it the trim and neat appearance and so closely associated in our minds with all lighthouses. However the other cottage remains and is still in use as a museum and visitors centre. 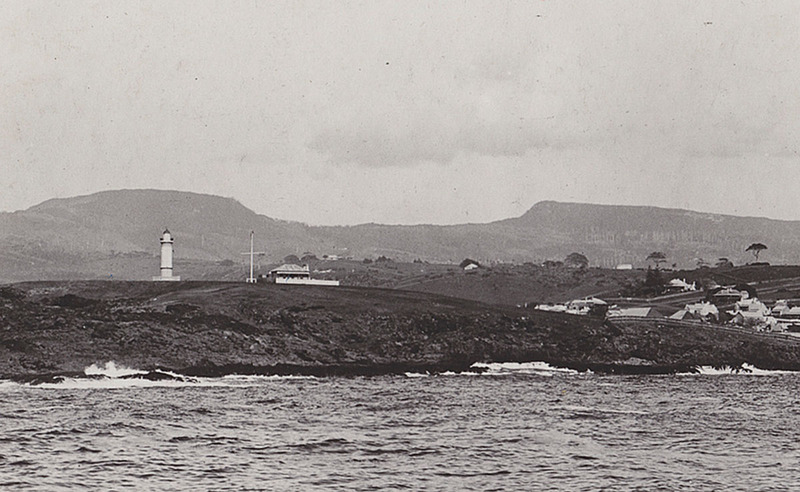 This cottage was the residence of the local harbour pilots from 1881 to 1981. It is typical of houses designed by the the office of the colonial architect to house public officials in country areas. Local materials were used such as basalt for the outer walls, ironbark for the floors and cedar for the fittings. Extensions were made in 1881 and again in the 1930s. 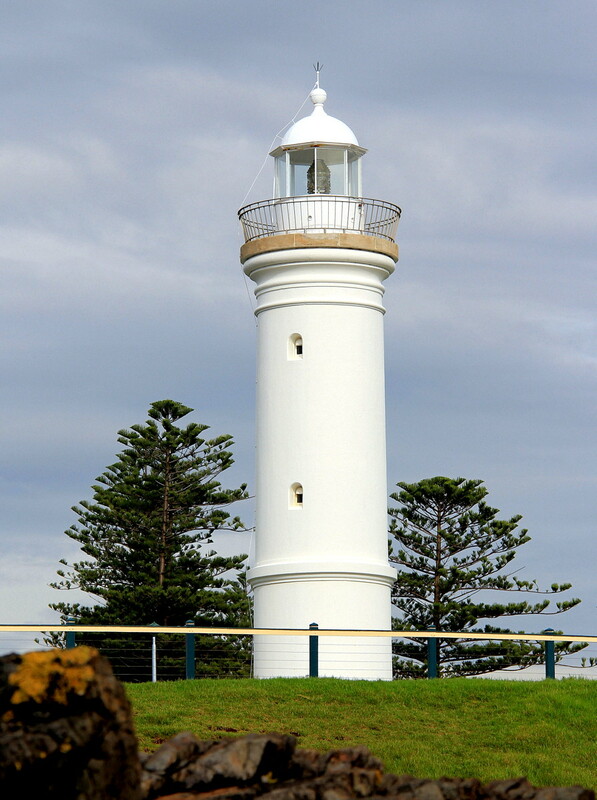 Despite much of the original character having been lost it was restored and renovated in the 1980s by the Kiama Historical Society. 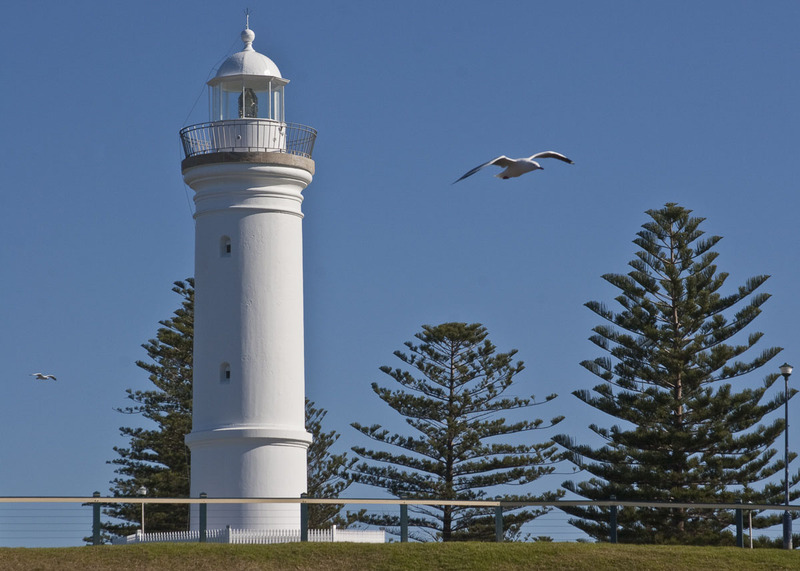 The lighthouse grounds are open all year round, just a short drive from the town of Kiama. 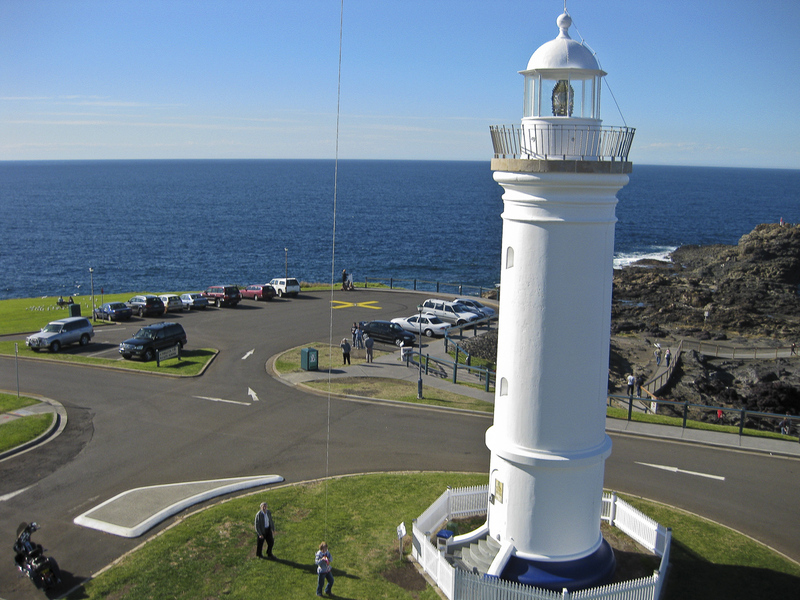 The Kiama Pilot’s Cottage Museum is in one of the former keepers cottages and is close to the tower.